“You give a tenth of your spices – mint, dill and cummin. 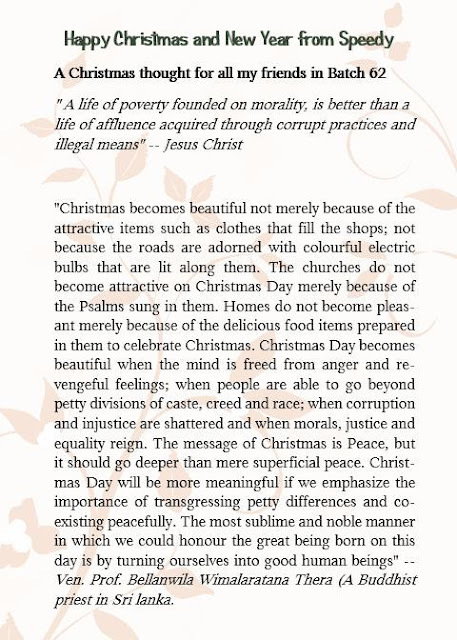 But you have neglected the more important matters of the Law – justice, mercy and faithfulness.” The whole life of Jesus Christ was dedicated to bringing about an ethically good society, where the people would find peace and happiness; to free the average people from oppression of the privileged class. The author of the quote I incorrectly attributed to Jesus, comes to the conclusion which I quoted and I should have stated that it was not a direct quote from the Gospel, for which I apologise. The message however is strong and the Ven Wimalaratna spoke at a time of ethnic tension in Sri Lanka and what he said is truly inspirational and worthy of dissemination. With such bold expressions, Jesus tried to drive the point that a life of poverty founded on morality, is better than a life of affluence acquired through corrupt practices and illegal means. As it happens, I do agree with the conclusion although it was inaccurate to attribute it to Jesus directly. By the way, may I add that the Author of the Jesus quote was NOT the Ven. Wimalaratne. so that we can close our eyes in peace at the end of our days . Each person has the choice, and as Zita says- the greater the number of people that follow the correct path, the better the world will be. Mahendra, I couldn't help reading this again before the New Year as it has so many elements that we need to remind ourselves daily and what better time than just before a New Year. I am proud of all of you spreading good will and unique messages at this time of the year and felt like writing these lines. Happy New Year to our lovely friends and batch mates who we were so privileged to spend our training years with! I too agree with the conclusion. What a wonderful world it would be if all its citizens lived by these words and ethics.